The big news this issue is the CT Department of Energy and Environmental Protection's (DEEP) announcement of their purchase of the 450-acre Bissell/Mason property, which includes the upper Tankerhoosen River. The new property will be known as the Tankerhoosen Wildlife Management Area. This is the DEEP's largest purchase and adjoins the Belding Wildlife Management Area thus preserving a significant portion of the Tankerhoosen Valley. To introduce you to the Tankerhoosen WMA we've created a page with a description of the resources, the history of the property, its environmental importance and recreational opportunities. There is also a slide show of a journey along the first mile of the river. This will give you an understanding of our new resource. 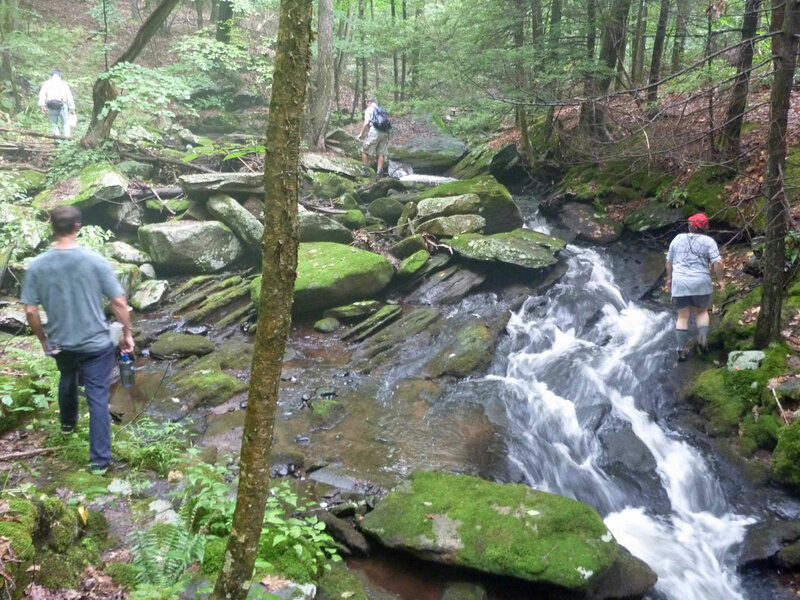 Planned events and hikes in the area this summer are surprisingly few except for children. For them it's an opportunity to play outside and learn about the natural world around them. Most of the flowers are appearing early this year. The Belding Wildflower Meadow on Bread & Milk Road is about to burst into color and should be a delight for the eye into September. Make your trips around town a little longer and swing by the field. 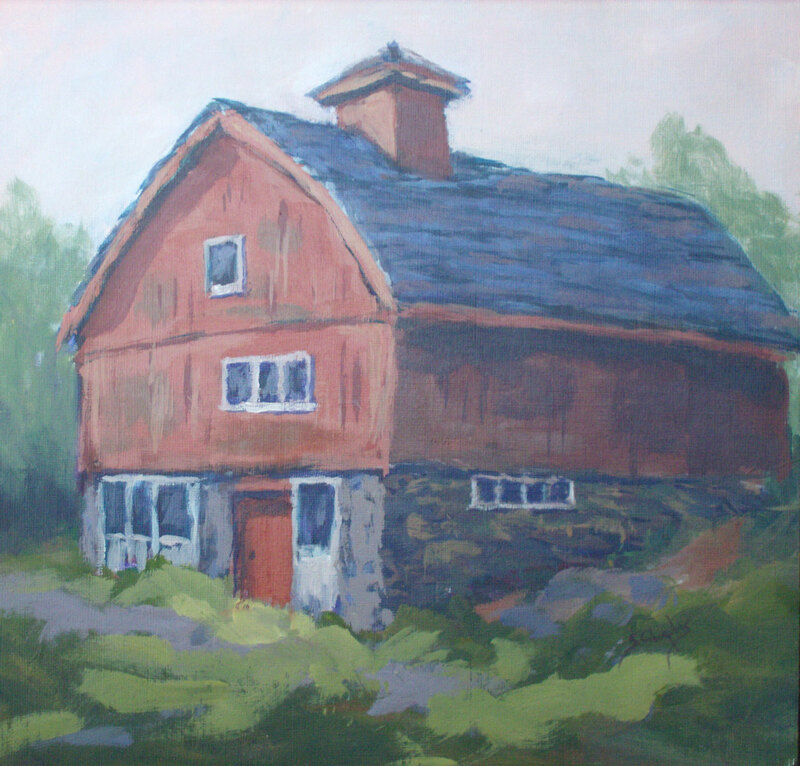 Also in this issue we introduce you to an artist who enjoys painting here, a lost treasure - our first library, a Memorial Day custom, plus an idea of what farm life was like in Vernon Center 90 years ago. Few residents are aware of the 2009 Tankerhoosen River Watershed Management Plan. Its an important study and guideline for preserving the valley. It establishes a baseline and contains detailed information and maps on the area. Please take time to become familiar with it and at least review the Table of Contents. The Tankerhoosen Wildlife Management Area (WMA) was recently purchased by the Connecticut Department of Energy and Environmental Protection (DEEP). The 449-acre parcel, part of a property originally purchased by LEBBEUS F. BISSELL in the 1920's, has been used by the family for recreation for generations. It includes the upper Tankerhoosen River and adjoins the Belding Wildlife Management Area. 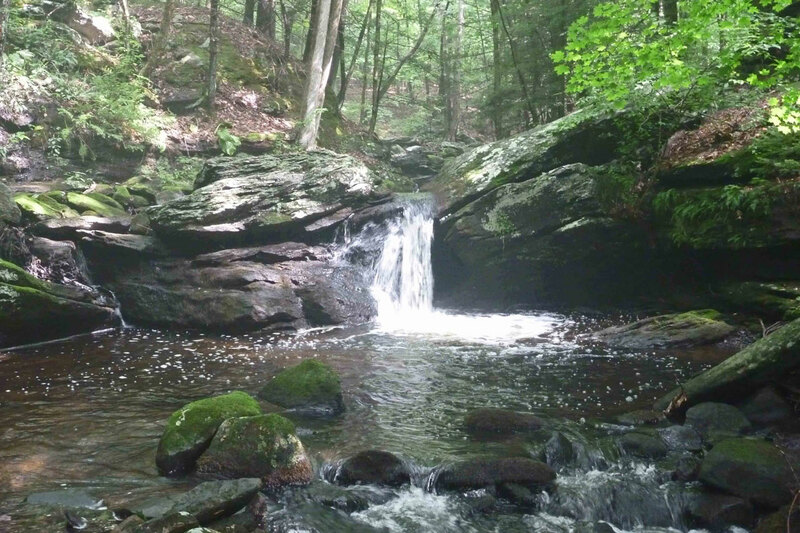 Largely undeveloped and with limited trails the area is highly valued by the CT DEEP as an ecologically intact and environmentally sensitive watershed and is their largest single purchase. Learn about the property, its features, history, environmental importance and the recreational opportunities. » Go to Tankerhoosen Wildlife Management Area. The new Tankerhoosen WMA includes the first mile of the Tankerhoosen River from Walker Reservoir East to the Belding WMA. This part of the river winds through woods and over rocky outcrops. It also includes some of the best catch and release wild trout fishing in the eastern section of Connecticut. Since this area has been on private land and trails are rough few residents have had the opportunity to see it. We had the opportunity to walk this part of the river in 2010 and have created a photo album and slide show to introduce it to readers. Even if you never visit you'll have a sense of what the upper river and the land it flows through are like. » Go to upper Tankerhoosen River photo album. Two of the most interesting valley events - the Friends of Valley Fall's Artists Day and the Vernon Garden Club's Garden Tour are biannual events and won't take place this year. And there are no announced hikes planned for summer so adults are on your own. But children's programs are underway so take advantage of the opportunity to introduce your children to the natural world. Each Thursday until August 4 the Belding Wildlife Management Area has a nature program for children. Meet at Bread and Milk Road from 9-11 a.m. for programs on nature photography, insects, stream life, plants and wildlife. Programs are free. Go to Activities for the schedule. During the summer school vacation the Vernon Parks & Recreation Department operates the weekly Valley Falls Nature Camp from 9 a.m. - 3:30 p.m. each week day at Valley Falls Park. This camp is for children ages 6-12 years old. Campers meet at the Valley Falls Pavilion in the morning and are picked up there in the afternoon. The camp features nature with special explorations in the pond, learn about fishing, excursions on hiking trails, special guest presenters and much more. 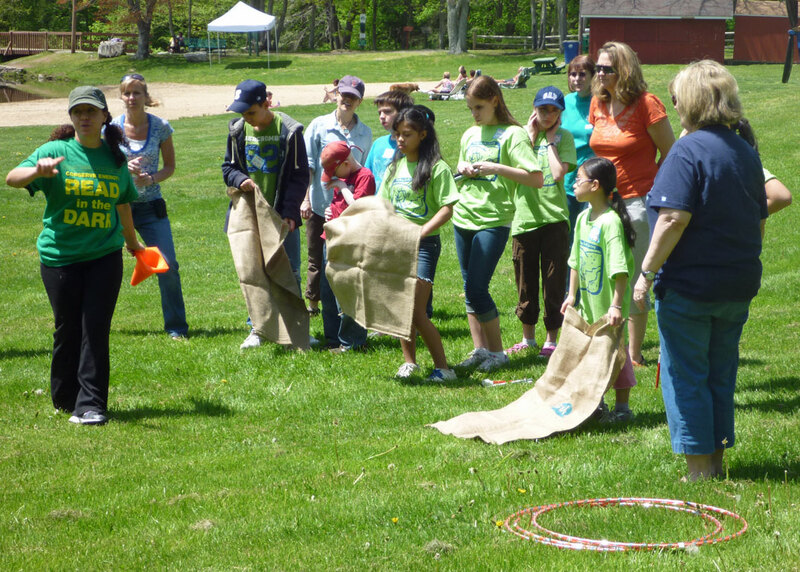 Campers will also enjoy camp games, arts and crafts, and swim time. You can get more information or register online or call (860) 870-3520. 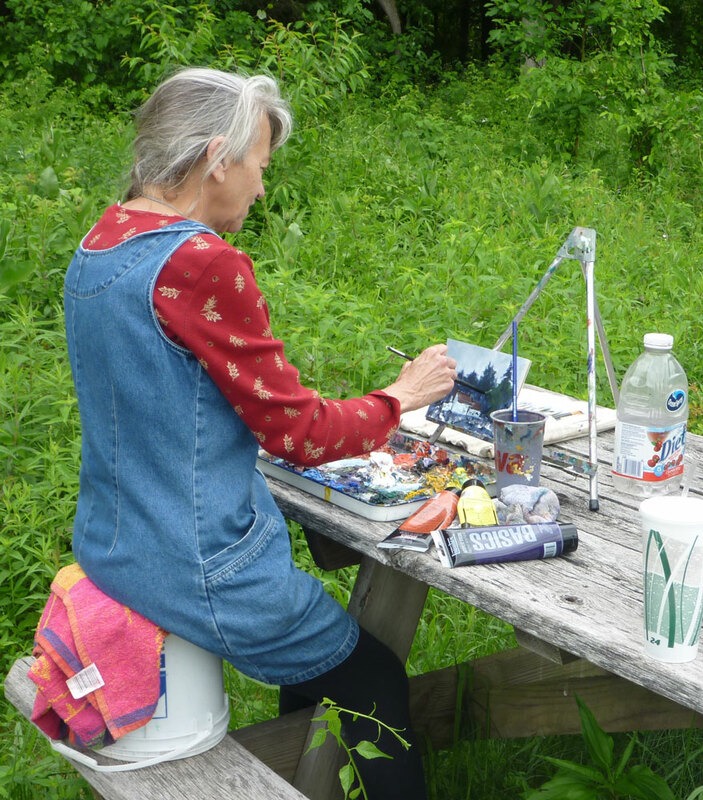 Last year on one of our walks we came upon artist SHARON CHAPLES painting at the Wildflower Meadow on Bread & Milk Road when it was near its peak of color. Since then her work has been featured by the Friends of Valley Falls and on the cover of The Hartford Courant's iCourant. Sharon enjoys open air painting and has done a number of pieces on the Tankerhoosen Valley. It seemed fitting as the Vernon Community Arts Center is opening in Vernon Center to include a page on our website featuring Sharon's area paintings and providing more information about her. We'll also scatter some of her paintings around the website. We hope this will be just the first of pages featuring artists and photographers who enjoy capturing the Tankerhoosen Valley. Please let us know of others who might be interested in sharing their work. » View more of Sharon Chaples' Tankerhoosen paintings. JEAN KANTER KLOTHE was born in Vernon in 1908 and lived on Tunnel Road about where Whitney T. Ferguson III Road is now. Her family owned a 100-acre chicken farm at that location which continued until the highway expansion in the late 1970's. Her memoir, published in the Vernon Historical Society's March 2005 newsletter, describes growing up on the farm in the 1910's and 1920's and the changing seasons in Vernon Center at a time when it was still a farming community. Jean's parents BENJAMIN and ESTHER KANTER emigrated from Romania in 1905 and were part of the Jewish migration that brought families through Ellis Island to Connecticut farms in the Colchester and Ellington areas, which included Vernon. 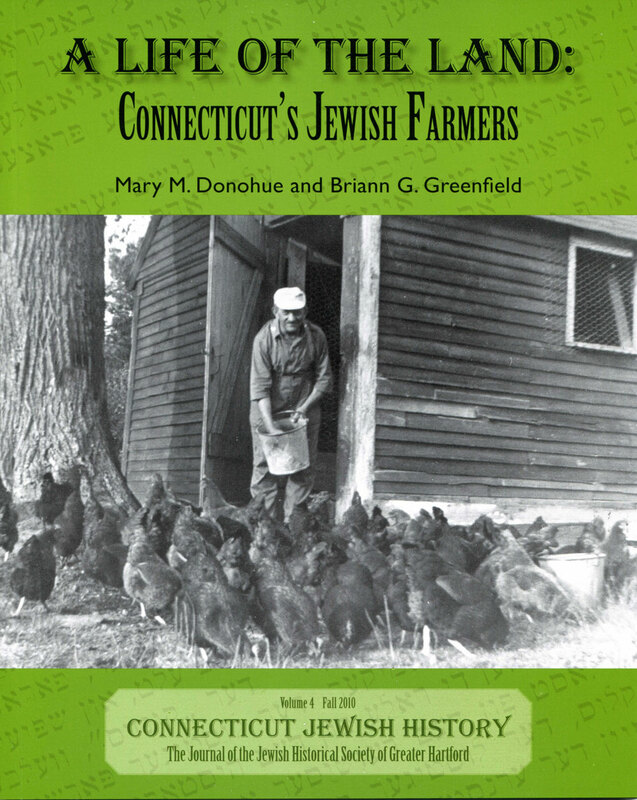 Their story is told in a recent book "A Life of the Land: Connecticut's Jewish Farmers" by MARY M. DONOHUE and BREIANN GREENFIELD. Jean's memoir is rich in detail and provides a wonderful feeling of growing up on a Vernon Center farm nearly a hundred years ago. » Read Vernon Historical Society pdf article. » Visit Vernon Historical Society Archives. Certainly one of Vernon's most distinctive buildings, the structure originally known as 'The Library' and later 'The Office' was at the center of Talcottville on the corner of Main and Elm Streets, where the church parking lot is currently located. This spectacular old building was built about 1880 and survived to the modern era. 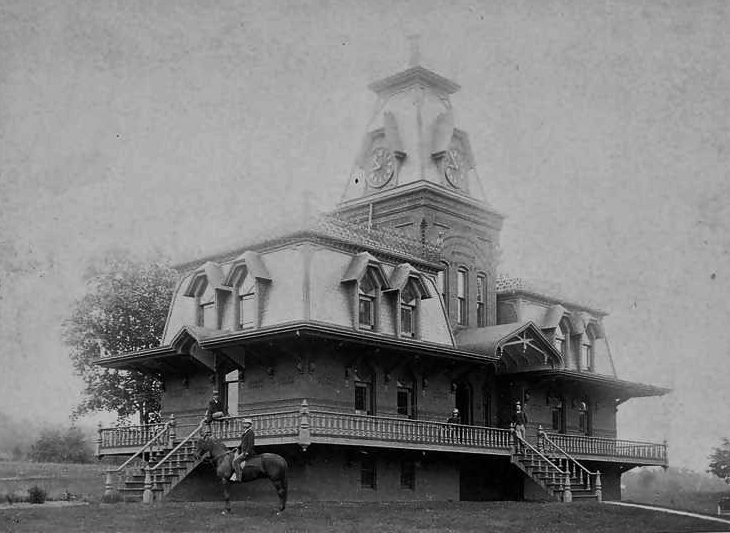 Constructed by the Talcott Brothers, this Victorian Lady was originally a library for mill families before the Rockville Public Library was built in 1893. At the time it was not unusual for mills to house libraries for workers. It was also a museum for the community and served the fire department. After the first Talcottville church burned in 1908 and the Rockville Public Library was available, the Talcott Brothers moved the mill's office into this building. As the years passed and the building aged it began to deteriorate. First the porch went and it was regrettably torn down in 1968. The old clock was saved and is part of what is now Motel 6 near Golfland. » Learn more about The Library/Office. Mount Hope Cemetery in Talcottville is the home of one of Connecticut's earliest Civil War monuments, an obelisk at the highest point in the cemetery. The cemetery, donated by the Talcott Brothers, was dedicated in 1867 and the memorial monument was dedicated two years later in 1869. The memorial contains the names of those from the area who gave their lives in the war. 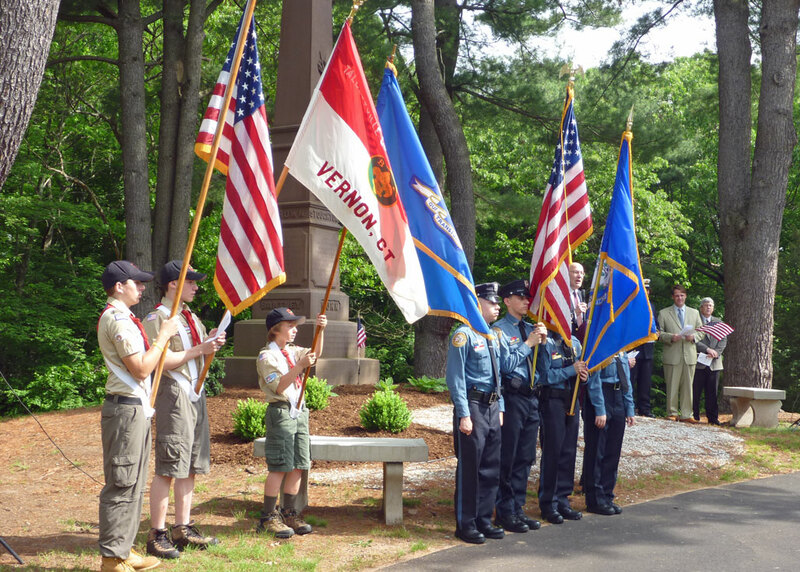 Each Memorial Day the town of Vernon has two parades. The primary parade is held in Rockville on Monday, but on Sunday one of the state's shortest parades takes place in Talcottville. Marchers begin at the Congregational Church and proceed to the Civil War monument in the cemetery where ceremonies are held. The parade usually includes Vernon's mayor and council members, as well as the fire and police departments, scout groups and veterans. Although we're not sure when the first parade was held, older residents remember it as part of their childhood. At a time when mill workers lived within walking distance of work this would have been a major annual event and may have been followed by a church service, picnic and games. During the early part of the last century Talcottville also had an award winning fife and drum corps, which certainly would have also participated. The current parade and ceremony are but a reminder of what was once a major annual highlight in the life of a close knit, thriving village proud its people and accomplishments. » Go to Memorial Day Parade. The Tankerhoosen River has long been recognized as an important natural resource and a key inland watershed critical to the health of Long Island Sound. Of utmost importance to these high quality watersheds is protection of the headwaters regions. 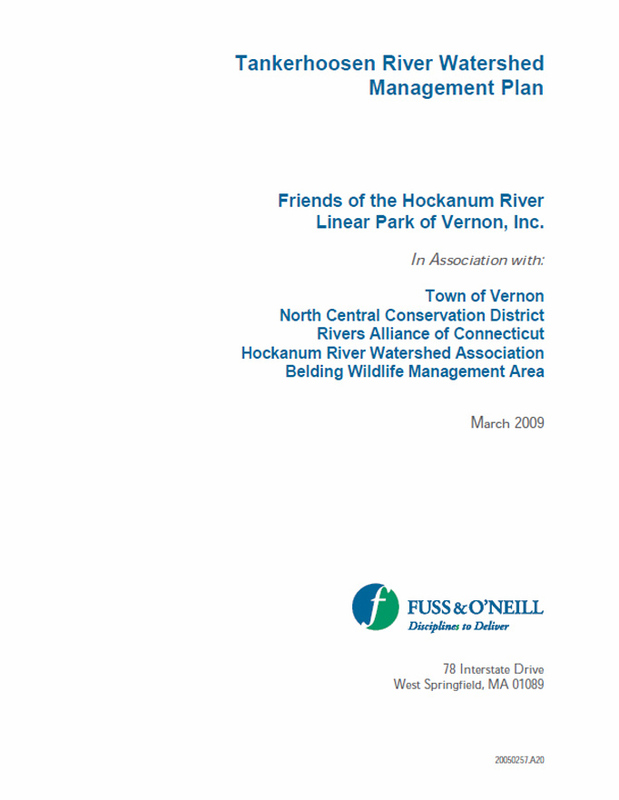 In 2009 a four year study was completed with Fuss & O'Neill to develop a management plan for the watershed. 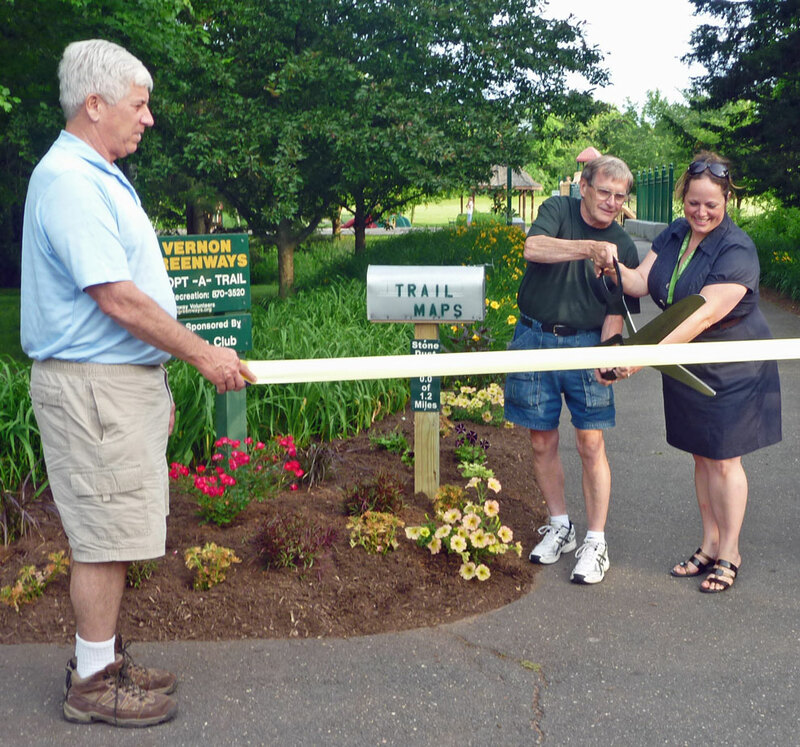 The $123,000 cost was funded by six local organizations, including the Friends of the Hockanum River Linear Park Inc., Town of Vernon, Belding Wildlife Trust, North Central Conservation District, Hockanum River Watershed Association, and Rivers Alliance of Connecticut, Inc. The 157 page report contains a wealth of information and maps on the river valley. Sections include Baseline Watershed Conditions, Field Inventories, Land Use Regulatory Review, Watershed Goals & Objectives and Watershed Management Recommendations. Few residents and users of the Tankerhoosen Valley are familiar with the study and its importance. Now posted on our website you can learn more about the area and what the town should be doing to preserve it for you and your children. Please take the time to become familiar with the document. » Learn more about the Tankerhoosen Management Plan and implementation efforts.